China's President Xi Jinping speaks during the opening session of the 19th National Congress of the Communist Party of China at the Great Hall of the People in Beijing, China October 18, 2017. BEIJING - China’s campaign against corruption has achieved “overwhelming momentum”, President Xi Jinping said on Wednesday at the start of a critical Communist Party congress expected to cement his authority. Xi’s speech kicks off the twice-a-decade congress, a week-long, mostly closed-door conclave that will culminate with the selection of a new Politburo Standing Committee that will rule China’s 1.4 billion people for the next five years. Speaking to more than 2,000 delegates in Beijing’s cavernous Great Hall of the People, including 91-year-old former president Jiang Zemin, Xi praised the party’s success, particularly his high-profile anti-graft campaign. “The fight against corruption has formed an overwhelming posture and strengthened in development,” Xi said in a speech carried live across the nation on state television. Xi has waged a relentless fight against deep-rooted graft since assuming power five years ago, with more than one million officials punished and dozens of former senior officials jailed. He also said China had firmly opposed and prevented independence for self-ruled Taiwan, claimed by Beijing as its own, over the past five years. While the speech will be high on aspiration and short on policy specifics, its language will be parsed for signals or policy directives, including on the direction of reforms for the world’s second-largest economy. Xi has consolidated power swiftly since assuming the party leadership in 2012, locking up political rivals for corruption, restructuring the military and asserting China’s rising might on the world stage. Focus at the congress will be on how Xi plans to put his expanded authority to use. Key questions include whether Xi ally and top corruption-buster Wang Qishan will stay on past traditional retirement age and to what extent Xi will promote allies into senior positions. Close attention will also be paid to any moves that would enable Xi to stay on in a leadership capacity after his second term ends in 2022. That could include resurrecting the position of party chairman, a title that would put him on par with Mao Zedong. One of the most important signals for that would be whether - or how often - Xi is referred to as “lingxiu”, or leader. That honorific has been bestowed on only two others since the 1949 founding of the People’s Republic of China: Mao and his short-lived successor, Hua Guofeng. Such decisions will be formally announced at the end of the congress next week. 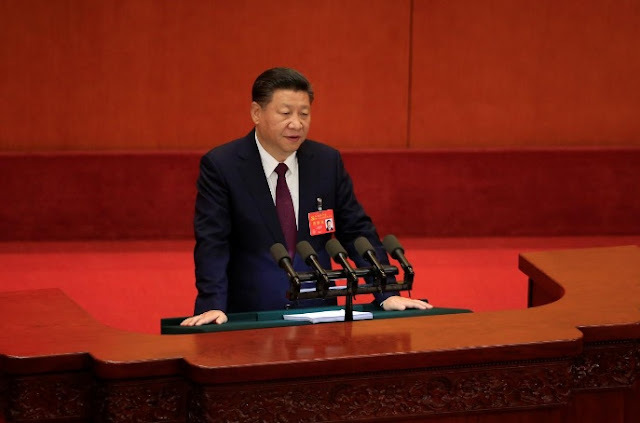 China’s campaign against corruption has achieved “overwhelming momentum”, President Xi Jinping said on Wednesday at the start of a critical Communist Party congress expected to cement his authority.